A muscle-bound 28-year-old software engineer from D.C. who goes by the name Sev has taken an unlikely Pokémon character, created a very simple Cosplay costume and is becoming something of a web sensation. Sev’s costume is of the Magikarp, which while it can jump over mountains with its splashing prowess, it has very limited fighting skills and a bit of a wimpy rep. Not so Sev’s homage. His costume consists of an awesomely colorful, gaping-mouthed Magikarp mask/helmet made of foam, and that’s about it. Sev is totally ripped, so he wears the mask and a skimpy swimsuit, and the result is anything but wimpy. 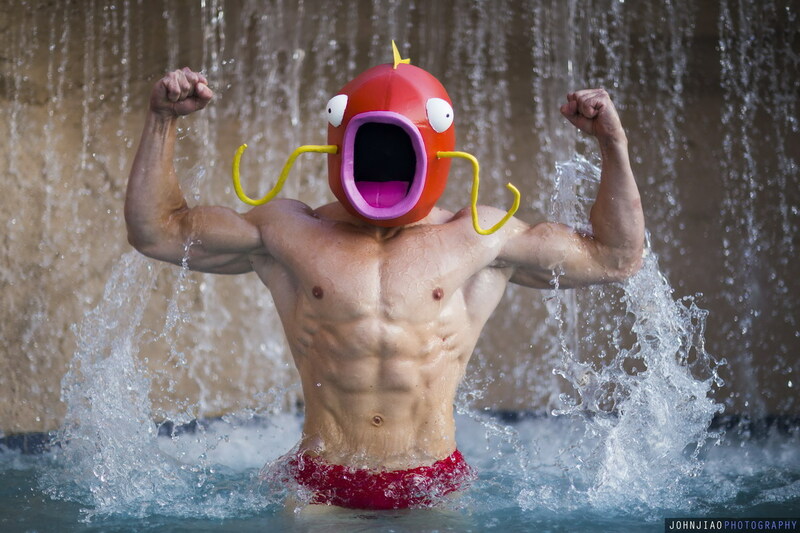 As you might expect, the mask took very little time to construct — about a week – but he says he has spent close to seven years pumping up his bod to near perfection, which women often ask to touch when he is in his Magikarp costume at comic events. On his Facebook page, Sev, who hails from Russia, says he is “Dedicated to fitness, nutrition, and hopefully making badass cosplays!” Mission accomplished.